Pictured above: NYS Senator Martin Golden, 2017 New York Advocate Award winner Nicole Faccio, NYS Assemblymember Linda B. Rosenthal, LE&RN Honorary Board Member Steve Guttenberg, and LE&RN President & CEO William Repicci at the 2017 New York #LymphWalk. An LE Patient Education Bill (A08829-B/S07765B), championed by Assemblymember Linda Rosenthal, authored by LE&RN, and sponsored by Senator Martin Golden, passed the New York legislature and was signed by Governor Cuomo on October 2. The legislation mandates that the New York State Department of Health design an informational packet about lymphedema and require that every general hospital distribute such a packet to all patients at high risk of developing lymphedema. Read LE&RN's press release on this advocacy achievement. The ninth annual New York Run/Walk to Fight Lymphedema & Lymphatic Diseases will recognize this first-in-the-nation development and major victory for LE education by honoring the work and contributions of legislative aides Gus Ipsen (office of NYS Assemblymember Linda B. Rosenthal) and Meg Brown (office of NYS Senator Martin Golden), who were instrumental in navigating the bill through the legislature in Albany. Join LE&RN at Prospect Park in Brooklyn on November 10 as we commemorate 20 years of fighting LE and LD through education, research, and advocacy. New York is where it all began and this year we mark a major milestone with the passage of the LE Patient Education bill. 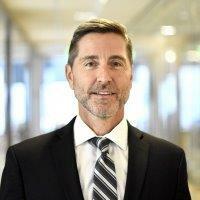 President & CEO of LE&RN William Repicci will present LE&RN's new project to create standards for Centers of Excellence for Lymphatic Disease Diagnosis and Treatment at the Clinical Symposium and will kick off the Patient Symposium at the 2nd annual Harvard Lymphedema Symposium, November 2-3, in Boston at Merck Research Laboratories. LE&RN Spokesperson and Academy Award-winning actress Kathy Bates will deliver the keynote address, "Living with Lymphedema," on Day 2 of this two-day conference, allowing attendees of the Clinical Symposium and the Patient Symposium to attend. World-renowned international faculty will share and discuss the state of the art in lymphedema diagnosis and treatment. Videos from last year's event are available on LE&RN's website. "Navigating Dense Breasts and the Breast Cancer Journey: A FREE Patient and Caregiver Support Event" November 4, 2018, Boston, MA. This is one day after the 2nd annual Lymphedema Symposium in Boston. LE&RN met with National Institutes of Health (NIH) on October 4 in DC to make the case for increases in lymphatic funding at the NIH. LE&RN co-founder and Founding Chair of LE&RN's Scientific and Medical Advisory Council Dr. Stanley G. Rockson attended along with LE&RN President & CEO William Repicci. Although LE&RN Spokesperson Kathy Bates was unable to attend in person, she forwarded a statement of support which was read at the meetings. Read William Repicci's letter to LE&RN Supporting Members about this effort here. Photo: NHLBI Director, Gary H. Gibbons, M.D. 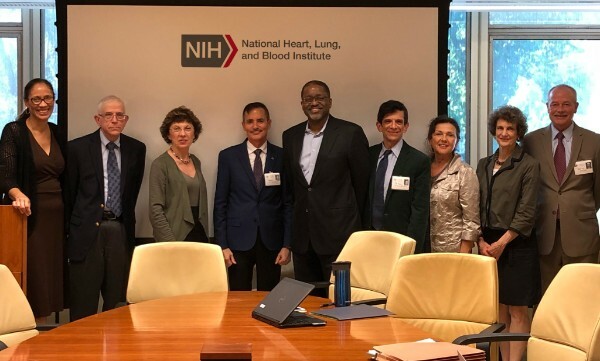 (center), with LE&RN and NHLBI staff, October, 4, 2018. Chapter Chair Tim Walsh (pictured at right) wrote to LE&RN Supporters as he launched LE&RN Florida. LE&RN is honored to have been invited to participate in the upcoming Congress of the American College of Phlebology, in Nashville, TN, November 8-11. If you will be attending, let us know and stop by the LE&RN information booth, Thursday and Friday, November 8-9! Research breakthrough from LE&RN Post-Doctoral Fellow, Sathish Srinivasan, Ph.D.
Scientists at the Oklahoma Medical Research Foundation have broken new ground in understanding how the lymphatic system works, potentially opening the door for future therapies. A lead investigator on this study, Sathish Srinivasan, Ph.D., was one of LE&RN's early post-doctoral fellowship recipients in 2006. Read and share this powerful guest blog, "Silence," by Veronica "Vern" Seneriz, LE&RN Texas Chapter Chair and founder of LymphieStrong. 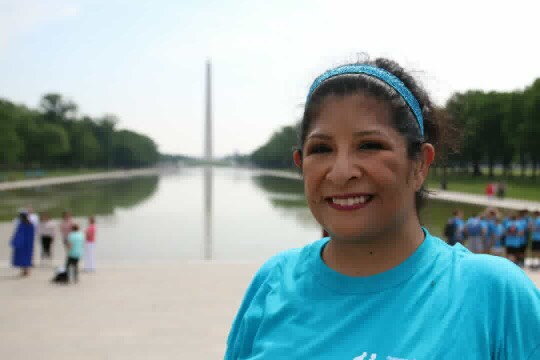 Vern is pictured at left at the 2018 Walk to Fight Lymphedema & Lymphatic Diseases in DC. The next event in DC will be March 30, 2019. Mark your calendar. LE&RN thanks Dr. Stanley G. Rockson for presenting "The Changing Field of Lymphatics" on Livestream for the LE&RN Symposium Series. LE&RN Symposiums are made possible by LE&RN Supporting Members and Corporate Sponsors. Past Symposium videos are available on LE&RN's website. Researchers at Beth Israel Deaconess Medical Center in Boston, MA, are conducting a study to demonstrate the feasibility and effectiveness of acupuncture for patients with breast cancer-related lymphedema. You may be eligible for this study if you have a single arm affected by lymphedema following breast cancer treatment. More details and contact information is available on LE&RN's website. Researchers at UCSF are conducting a study to learn if treatment with a negative pressure massage device (LymphaTouch) is effective, compared to manual lymphatic drainage (MLD) massage, at improving swelling, skin condition, and movement in the arms of women with lymphedema. Details can be found on LE&RN's website. LE&RN thanks all those who have been supporting LE&RN with birthday and other fundraisers on Facebook. You are making a difference in the lives of those who struggle with LE and LD. Thank you! 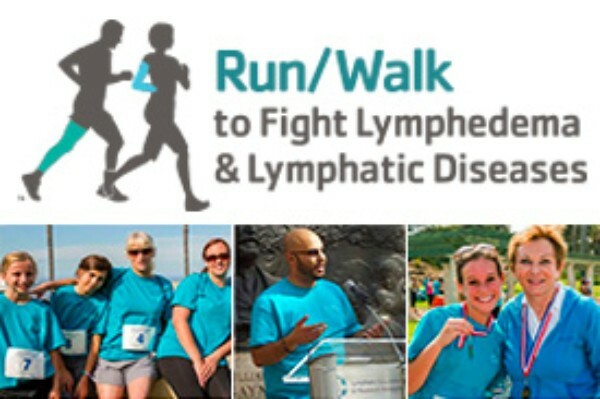 LE&RN's Virtual Expo brings together companies that offer products and services to the lymphedema, lipedema, and lymphatic disease communities. These companies offer videos on a variety of topics. Check out LE&RN'S Virtual Expo today. LE&RN's programs to fight LE and LD through education, research, and advocacy are only possible because of Supporting Members and corporate sponsors. If you are a Supporting Member, thank you. If you have not yet joined, please join the fight today.